All he wants now from the government is to ensure that the market’s maintenance does not suffer. Celebrities, bureaucrats and politicians visit his store in Russell Market, but Mr Mohammed Idrees Choudhury, is famous not just for the dry fruits he imports from Iran, Jordan and other countries, but also for leading the battle to save the market’s heritage building from demolition following the 2012 fire. Today, despite his lack of education, he has been conferred an honorary doctorate in recognition of this achievement and his philanthropic work. Nikhil Gangadhar reports. It was in 1927 that the Russell Market was built in the heart of the city. One of the oldest markets of Bengaluru, it was the British, who constructed it to serve the needs of their army personnel and their families. With its pillars imported from Britain, the market soon took shape and down the years has become popular among one and all , selling everything from meat, vegetables, and fruits to flowers and basic commodities. Today over 450 shops at the market in Shivajinagar meet most needs of Bengalureans, giving them quality produce for a good price. But as fate would have it the market was gutted in a fire in 2012, wiping out most of its shops. The knee- jerk reaction of the authorities was to bring down the heritage structure and replace it with a swanky mall. But they hadn’t reckoned with the shopkeepers, who saw the market as their second home. They fought hard and won the struggle to save it and it is thanks to them that one of the city’s most cherished heritage structures, continues to stand tall amidst the bustle of development around it. The man, who is credited with leading the vendors in their battle to save Russell Market, is Mr Mohammed Idrees Choudhury, secretary of its association, who is deeply loyal to it as it was here that he grew to learn the nuances of the business he inherited from his father and forefathers. Considered the backbone of the market, he is the go-to man for any problem a vendor may have in its grounds. Gifted with the ability to make quick decisions by hitting all the right notes, he is approached even by people of the area when they are in need of advice. His shop in the market, Delicious Dates, is visited not just by ordinary shoppers but also celebrities, politicians, sportspersons and bureaucrats. He is known for selling a variety of dry fruits, especially dates, from different countries like Iran, South America, West Asia and Africa. Despite not having much of an education, he can today call himself Dr Choudhury if he so wishes as on November 17 this year he was conferred an honorary doctorate in Chennai by the National Virtual University for Peace and Education in recognition not only of his role in saving the Russell Market, but also in going to the help of Chennaiites during the floods, when he arranged to send tonnes of foods and other materials to the city from Bengaluru. But he admits that never in his wildest dreams did he think he would ever get a doctorate. “This was a surprise to me. 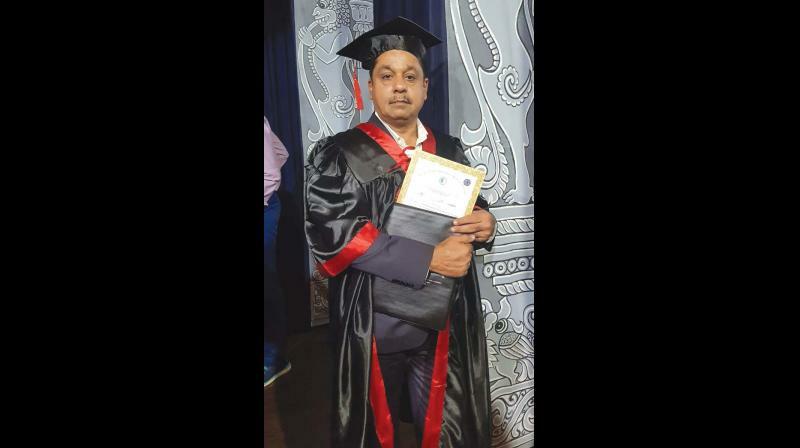 For the first time, a vendor from the market has been conferred a doctorate. I hope this will encourage the others here to do good work for a cause. I have always believed that when you give, you get more. As humans, we need to help each other in times of struggle. During the Chennai floods, we sent loads of material. If not at such a time, when can we help our brothers ?” he asks pertinently. Standing strong against the civic bodies, which planned to demolish he market and build a mall in its place , the vendors decided to pool in money and restore the market. “We pulled off a miracle! This was possible because everyone was united and trusted each other,” says Mr Choudhury with satisfaction. All he wants now from the government is to ensure that the market’s maintenance does not suffer. “We need proper toilets, garbage bins and security guards,” he pleads, clearly hoping the authorities will do at least this much to add to the value of one of the city’s oldest and most loved landmarks.